Very good. Trade paperback (US). Glued binding. 249 p. Audience: General/trade. HA37/2/13 SOFTCOVER IN STOCK RETURNS NO? ' S TRACKING WE SHIP ALL BUSINESS DAYS FROM MA IN 24 HRS OR LESS! ! ! Good. Trade paperback (US). Glued binding. 249 p. Used, Acceptable Condition, may show signs of wear and previous use include highlighting and writing. No guarantee on products that contain supplements. Please allow 4-14 business days for delivery. 100% Money Back Guarantee, Over 1, 000, 000 customers served. Very Good. Trade paperback (US). Glued binding. 249 p. In 1958, while directing the microfilming of a trove of archives that the US forces had taken from the Nazis at the end of WWII, a young American scholar named Gerhard Weinberg found the manuscript of a second book that Hitler had written but never published. Hitler follows the same tormented path taken by Edgar Allan Poe. He was a brillant man on one hand, and a psycopath on the other. As the stress of war grew so did his lose of contact with the real world. Interesting reading for someone looking for what might have been behind the decisions being made. Like Mein Kampf, this book provides insight into the mind and politics of history's greatest villain. Also like Mein Kampf, it shows how much Hitler appreciated the idea of repetition. If you repeat a lie often enough, it becomes the truth. This is less a book than a treatise on the specific question of South Tyrol in the 1920's. It is almost entirely devoted to this single question and Hitler's attempts to change the opinions of the majority of Germans, including the Nazi party. 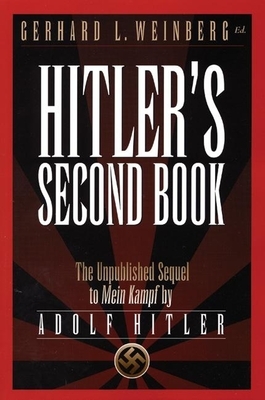 While Mein Kampf covered many topics and had some interesting historical anecdotes, the Second Book covers one topic and it isn't even a particularly interesting one. One good thing: the anti-semitism from the first book is toned down quite a bit in the second. It's still there, but without the foaming at the mouth rhetoric.